It was a no-parking zone, but I decided to risk it anyway. Just pull over here, and I’ll get out and walk the rest of the way. He’s got a raging (= high) temperature. She was dressed in a black suit. I usually get dressed before I eat breakfast. I’m getting dressed – I’ll be ready in a minute. He was dressed in a dark grey suit. The rabbit/bird hopped across the grass. A bird hopped across the lawn. The children were hopping around the playground. Scoop out the melon with a spoon. He scooped the sand into a bucket. She scooped the children up and ran with them to safety. I scooped up my belongings into my handbag. 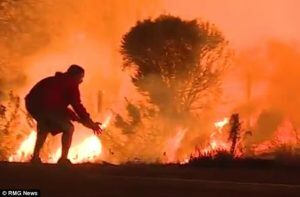 Some might say he’s hopping mad, but that did not stop a brave California motorist from pulling over to rescue a rabbit from a monster wildfire. 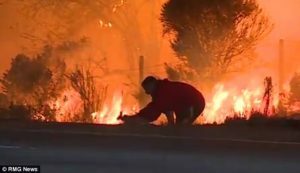 A news photographer for KABC who happened to be in Ventura County on Wednesday, covering the Thomas Fire, captured the moment the unnamed driver risked his life to save the furry critter from the flames. 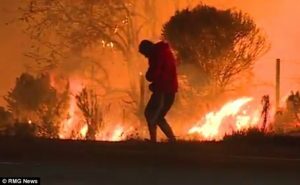 In the footage, the Good Samaritan stops his car along Highway 1 after spotting the rabbit and tries to grab it, but the animal hops away, inching closer towards the raging inferno that has engulfed the entire landscape around them. I happened to come across this book I think you would like. I happen to think he’s right (= I do, although others may not). I happened to meet an old friend in town. She happens to like cleaning (= she likes cleaning, although that is surprising). I happen to think he’s right (= I do think so, although you do not). Darryl spotted a woodpecker high on the tree. Hugh was spotted by local police and had to leave quickly. The boys had been spotted buying alcohol. The police spotted him driving a stolen car. We are inching towards an agreement. Share prices inched up/higher during the day. Residents watched the flames inch closer and closer. Stock prices inched higher throughout the afternoon. Interest rates have been inching up over the past year. In the short video documenting the man’s act of courage and compassion, the motorist – a young man wearing a red hooded sweatshirt and a pair of athletic shorts – appears increasingly anxious for the rabbit’s safety. He jumps up and down a couple of times, as if mimicking the critter’s own motions, and desperately tries to capture it. A few tense seconds later, the seemingly doomed rabbit turns tail on the savage fire and finally approaches its rescuer. The man then gently scoops up the furry animal, cradles it in his arms and tries to make it comfortable. KABC reported that the valiant animal lover declined to be interviewed at the scene. It’s unclear where he ended up taking the tiny wildfire survivor. Social media users who viewed and shared the video of the rabbit’s improbable rescue hailed the anonymous man a hero for putting himself in harm’s way to save an animal’s life. She looked as if she’d had some bad news. The house was in such a mess – it looked as though a bomb had dropped on it. The atmosphere in the courtroom was extremely tense. She was very tense as she waited for the interview. The family was faced with a tense financial situation. This is a doomed city. As soon as they saw we had guns, they turned tail and ran away. 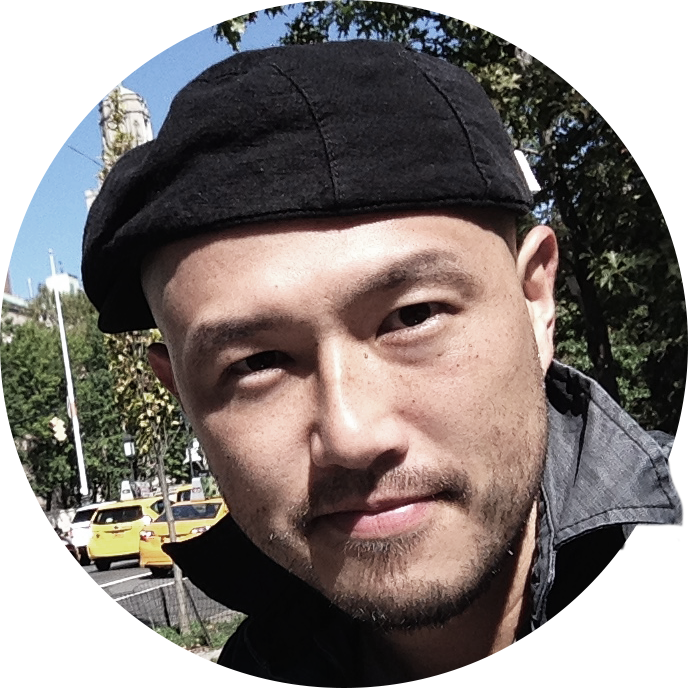 He writes about people who are savage and cruel. She cradled him tenderly in her arms. Joe cradled his cup of coffee and began to speak. The company has made a valiant effort/attempt in the last two years to make itself more efficient. The team made a valiant effort to take the lead in the third quarter, but they were too far behind. It’s improbable that a lawyer would give such advice. It’s highly improbable that Norris will agree. Heppner has been hailed as one of the finest tenors in the operatic world today. The Thomas Fire, the largest of the area’s wildfires, ignited on Monday and so far has charred more than 95,000 acres and destroyed more than 150 homes. 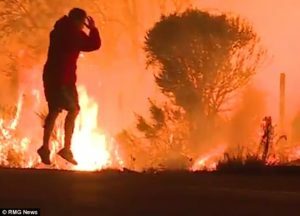 After causing some 50,000 residents of Ventura County to flee their homes over the past three days, the inferno continued its westward push on Thursday, forcing a few hundred Santa Barbara County residents to be evacuated and the closing of coastal Highway 101 north of Ventura city. According to latest reports, the Thomas fire is only 5 per cent contained. The fire was ignited by a spark from an electrical fault. The fuel spontaneously ignites because of the high temperature and pressure. The forest fire began when a spark from a campfire ignited some dry grass nearby. Grill the peppers until the skin starts to char. Cook the peppers under a hot grill until the skin chars. Firefighters are still battling to contain the blaze. Strong measures are urgently needed to contain the epidemic. Farms in the area have been closed off in an attempt to contain the disease. More police were sent to help contain the violence.